Continuing a trend of building their international presence, both in eBooks and beyond, Amazon appears to be making arrangements to bring their Kindle line to Japan as early as then end of this year. While the company has been operating their Amazon.jp site for some time now, there have been complications in offering customers the Kindle until this point. Hopefully that is soon to be a thing of the past. Japanese publishers have shown themselves to be very hesitant to allow Amazon to acquire content, citing concerns about the online retail giant’s increasing level of control and influence in anglophile markets. This, in addition to Amazon’s habitual price cuts led to them to question whether there was money to be made in Kindle Store content. After Sony’s recent successful entry with the Reader PRS-650 at the beginning of this year, though, there has been reason to hope these companies are coming around. If nothing else, there is definite pressure from consumers who are quickly growing increasingly familiar with the potential of eBooks and eReaders and want to be able to take advantage of them.The solution to the publisher impasse seems to have taken the form of building a predefined framework for the timing and rate of discounts. Publishers will, according to reports, be consulted before any such discounts were put in place. Should Amazon manage to carve out a place for the Kindle in the Japanese eBook market, it could be a huge move. Right now this space has been comparatively underexploited for a variety of reasons. To make it work, however, they’ll need to do more than just set up a Kindle Store. 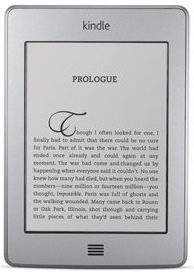 The first step will be getting the entire newest generation of Kindle eReaders out there. The Kindle 4 and Kindle Touch, due to their virtual keyboards, both provide the ability to display Japanese characters in every part of the eReader’s function. Just one advantage of doing away with the physical keyboard, I suppose. Without the Kindle Touch, however, competing with even the Sony PRS-T1 would be difficult no matter the price of the Kindle 4. Right now Amazon.uk is offering the Kindle 4 and the Kindle Keyboard without the touchscreen model, but that won’t do much good in an area where the English keyboard is less useful. These need to be available not just online but in retailers as well. Exposure will be vital, and partnerships will need to be formed. While the Kindle Fire is currently only available for pre-order in the US, it would make a great deal of sense for Amazon to push Japan as the first other market to get access to it. Unfortunately, given that this would require a lot of effort to grab distribution rights in a wide variety of media forms it seems like a long shot. An effort by Amazon to acquire these rights and expand its influence seems to be inevitable, but it won’t come quickly or easily and a half-hearted attempt would do more harm than good. During the 2010 Black Friday sales I was able to purchase Sony PRS-350 Pocket Edition (NYSE:SNE) from Dell (NASDAQ:DELL) for $130 which is $20 less than what it usually goes for. After playing around with the device for a while I decided to put together this review. While I mostly use Amazon Kindle (NASDAQ:AMZN) personally, I’ve also interacted with Nook, previous Sony eBook readers, namely PRS-505 and PRS-600 Touch as well as Apple iPad/iPhone, Android apps. I’ve been quite unhappy with several features of Sony eReaders and it was very interesting for me to see if these features were fixed. First of these shortcomings was the fact that you couldn’t do anything with the reader while it was charging via USB cable. You could read if you purchased optional AC power adapter but not otherwise. Sony PRS-350 doesn’t have a dedicated charging port. In fact the only connector it has is micro-USB that can be used for transferring books from your PC and charging. Unlike Kindle you still can’t read while charging from your computer. You can read when charging via PRSA-AC1 wall AC adapter. However this adapter costs an outrageous (some something this simple) sum of $30 and is quite bulky compared to similar AC-to-USB adapters for iPhone or Kindle. Not wanting to add to the army of such adapters I already have at home (especially for $30 a piece) I tried first several power adapters that I could dig up – namely from Apple iPhone 3G and Amazon Kindle 3. Sony reader treated the Apple adapter just a computer – it went into “USB Charging” screen that I couldn’t get out of. But it responded much better to Amazon Kindle adapter – the red charging light lit up and the battery began charging. Conclusion: To keep reading while charging the battery on Sony PRS-350 you either to buy a power adapter from Sony or find a compatible one since it seems that not all USB charging adapters are created equal. As far as ergonomics go, Sony PRS-350 is much smaller and ligher than Kindle 3 due to smaller screen and lack of keyboard. It will easily fit into most shirt pockets where Kindle would not. PRS-350 is comfortable to hold in hand and paging buttons are easy to use. So ergonomically it wins over Kindle. 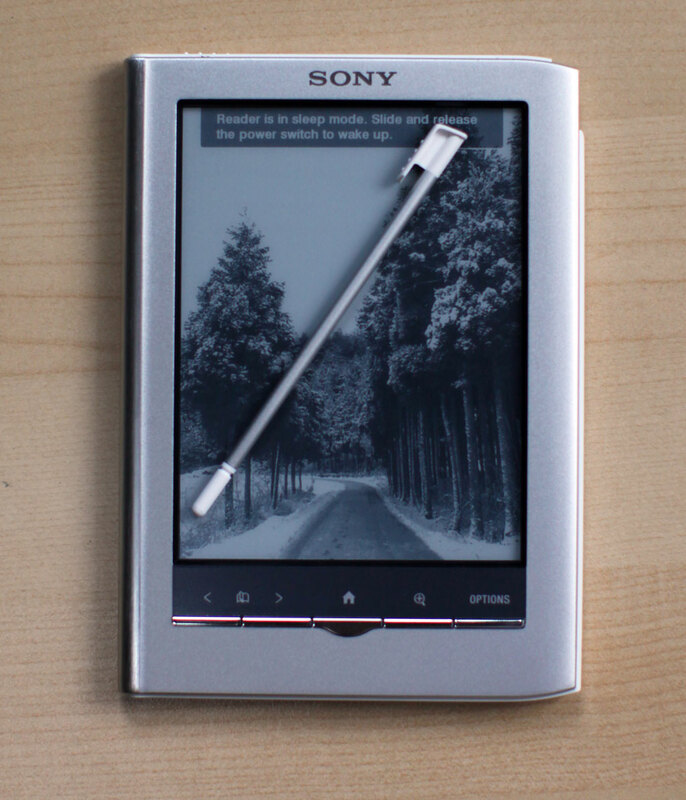 PRS-350/650/950 are Sony’s second attempt at building a touchscreen eReader, PRS-600 being the first one in 2009. In PRS-600 resistive touchscreen layer was overlaid over eInk display. While this approach works well with backlit LCD screens, with reflective eInk it produced a display with very poor contrast ratio (see comparison with Kindle 3 and 2). This was reported the most significant weakness of the device by both consumers and reviewers. In PRS-350, Sony used infrared touchscreen technology that doesn’t require anything being put on top of the screen. 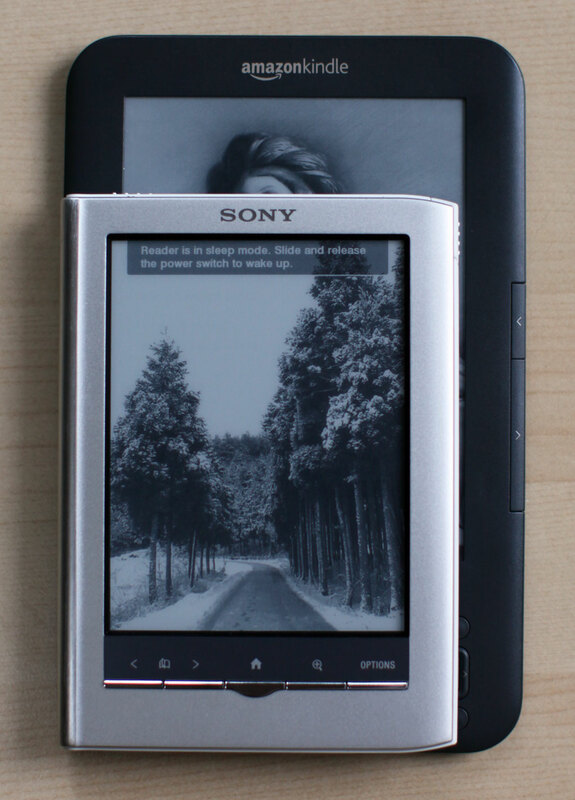 As a result, Sony PRS350 features latest generation high-contrast Pearl eInk screen in it’s full excellence same as Kindle 3. Screen in the Sony device has the same number of pixels as its Amazon counterpart, but one inch smaller diagonal. This results in slightly crisper but smaller images and text. Sony definitely has better ergonomics. It should be noted that Kindle ergonomics are very good too and would be “good enough” for most users. Sony has improved their device charging and power management story. Kindle still has a significant lead in this department with better battery life and ability to read while charging from computer USB port (a common scenario on an airplane). It should be noted that for most users it would make little difference. All-in-all, devices are tied right now so unless you intend to carry your eReader in ultra small purse where Kindle just would not fit. To fully evaluate the device I’m going to read Princess of Mars by Edgar Rice Burroughs on it and report on how it goes. I’ll also do some in-depth PDF support testing.